The MasteryConnect Parent Portal allows you to access your child’s progress in real time. As your student learns and becomes proficient in concepts and standards throughout the year, you can stay updated. For more information about setting up your parent portal access, take a look at our article on activating your parent portal. As soon as you sign in, you'll get an overall view of your child’s current classes and a quick glimpse of how many standards have been completed in each one. To view classes from past years, click Archived Classes. 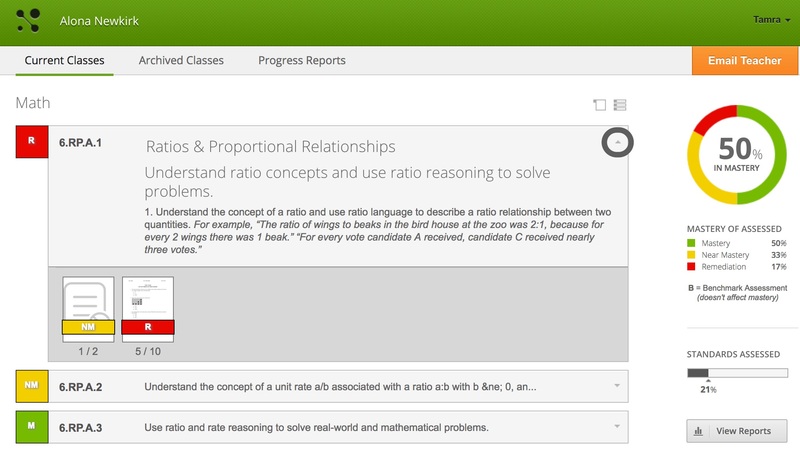 Click on the title of any class to view the concepts and standards for each, and see where your child is excelling or struggling in the classroom. Green indicates mastery of a standard, yellow indicates near-mastery, and red shows the need for additional help. The main color box indicates the mastery of the most recent assessment, this may change as your student progresses and learns the concepts. When you click the arrow on the right of each standard, you'll get a description of the standard and a quick view of the assessments that have been given for that standard, along with your child's overall score. Click any assessment to view more details of the assessment, the answer key and item analysis. Note: If you don't see these options, your child's teacher may have hidden the actual assessment or answer key to prevent sharing with other students that haven't completed it. 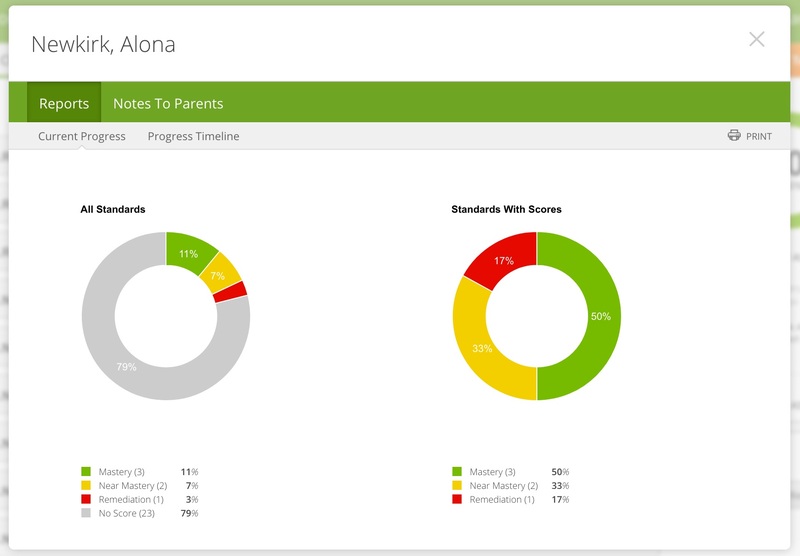 If your school uses standards-based progress reports in MasteryConnect, you can click Progress Reports to download and view them. Click on the orange Email Teacher button to send a message directly to your child's teacher. Click on View Reports at the bottom of the Mastery Percentage graph on the right to see a breakdown of the standard mastery levels and a timeline of your student's progress. In this window, you will also be able to view any notes from the teacher.